Stevenson Band Spiritwear will be available via an online store after January 1, 2019! Come back, then visit titan18.itemorder.com/sale to browse, order, and pay! Q: Can I write a check / send money to school? The Band Boosters offer a number of items online for purchase using a credit/debit card or e-check. No cash, paper checks, or money orders are accepted. To place an order, click the link below to make your selections and payment. Some items are available off the shelf, while others (such as Booster polos) must be ordered from an outside vendor and take time to process. 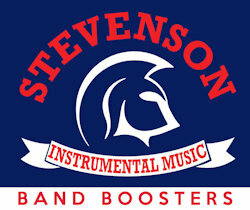 Once items are available, they will need to be picked up from the Stevenson Band Room.